Recently, after a walk on a snow-covered park, I thought about what trees do for our planet. Green “lungs of the planet” provide an oxygen production, fruit trees provide us with fruit and berries, esthetical function can not be forgotten too. But construction and production of furniture is one of the most important fields of wood application from very ancient times. Wood is special handling for these purposes. The surface processing is one of the main types of such processing. The surface of the wooden planks or beams should be flat and smooth for use in consumer purposes in most cases, such quality can be ensured by using a planer. We will talk about how to choose and buy such woodworking tool as electric wood planer machine today. People have the need to handle wood material a long time ago, according to meet this need were created special tools. The first planers appeared at the beginning of our era. In the 15th century planers are widely used for production purposes. These planers were a wooden tool with a metal blade (planer knives), which was put into effect by means of manual physical strength. Analogs of these ancient planers, only with a metal body, are used in our days too. However, with the development of technology, people want to spend less of their physical strength wherever electricity and mechanics can be used. In the other way productivity of handmade work can’t be high. These factors contributed to the fact that we have new power tools, such, for example, as electric jig saw or electric planer. Wood electric planer (planer machine) is a special electrical hand tool designed for planing wood material. Electric planer has such structure: the electric motor is placed in the body of the case, which is due to the special timing belt associated with a rotating knife drum. Sole plate or, as they say ski, placed at the base of the case, it have a direct contact with work piece. Electrical power of electric planer plays a very important role in its selection. Wood planing requires significant efforts, so planer productivity is directly dependent on it power. Hand-held electric planers can have 0.5 – 2.2 kW power. For example, electric planer Bosch PHO1 has a power 0.5 kW and planer Rebir IE – 5708C – 2,15 kW. If you need sometimes to handle a couple of boards you can get a model with 0.5-0.6 kW power. If you plan to use an electric planer more often – choose 0.7-0.9 kW power. Electric planers with 1kW or more power are already the professional planers. The rotating drum, where cutting blades fixed is the main element of electric planer. Speed of the drum is the number of turns that it makes per time unit. In fact, rotational speed indicates how many times the cutting blades face the treated surface for some time. Drum speed can range from 12,000 to 18,000 rpm in modern planers. It’s a pretty big performance. For example, in angle grinder speed does not exceed 11,000 rpm. The two cutting blades placed on the drum mainly, it means that at a frequency of 15,000 rpm each blade 15,000 times comes in contact with the surface in one minute. To perform a similar volume of work using simple hand planer, we would have to make 30 000 movements. We can compare the performance of a simple and electric planer by this indicator very clearly. You can orient to the frequency of rotation 15000-16000 rpm while purchasing. 3. Planing width and depth. Planing width shows the width of the material which electric planer can handle in one pass. It is measured in millimeters. Most current electrical planers have a 82 or 110 mm planing width. Bigger planing width reduces the number of passes for the complete surface treatment. Planing depth shows size of layer which will be removed by planing. Possibility to adjust this indicator from the minimum to the maximum value supported by a tool with a 0.1 mm step provided in most cases. Less powerful tool have maximum planing depth up to 2 mm, more powerful planers can have planing depth up to 4 mm. As I have said, sole plate with planer blades is the primary contact part of planer. Sole plate should be smooth, however, to prevent the emergence of so-called “air bags” it should have special grooves. Sometimes these grooves are almost invisible to the naked eye and we can check their availability only by the touch. 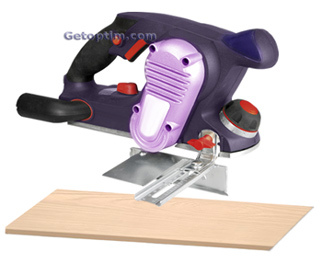 An electric planer is hand tool and its specificity implies the need rather long handmade with it. Therefore, the weight of the instrument is largely affects the performance of the operator. Weight of planer can be from 2.5 to 8 kg. Professional electric planer and can weigh 9 kg. Models with average power have 3,2-4 kg weight, you can orient to this weight. It is advisable to pay attention to usability of planer handles. Weight will be felt much less with comfortable ergonomic handles. Dust bag availability. Electric planer work forms a large number of dust, if the instrument is equipped with dust bag all dust will be collected in it and not fly apart around you. Lateral limiter presence. Lateral limiter is the device which attached to the planer and helps to increase its balance and accuracy. Depth gauge availability. Depth gauge helps determine the depth of planing. Some models are sold with a special device, which allows you to use the tool upside as a mini machine tool. To find out how to operate electric wood planing machine more precisely carefully read the manual, pay special attention to safety precautions.